Pop-up shop. You may have heard the term before, but are you familiar with what it means? Pop-up shops are part of a marketing trend that originated in Los Angeles, where retailers would set up a temporary sales space to promote the release of a new product, generate brand awareness, and even test new markets. Pop-ups have been used to promote nearly every consumer product imaginable: fashion, art, tech gadgets, and even automobiles. Experiential marketing agencies are usually the masterminds behind these temporary retail installations, and they take every aspect into mind when creating these concepts. Everything from location, months or season of operation, product presentation, and layout of the store are considered. Most importantly, all of these factors must contribute to creating a great experience for the visitor of the pop-up. After all, experiences are becoming a driving force in consumer spending. A study done by Harris Group found that 72% of millennials prefer to spend their money on experiences over material possessions. This may be what is driving the fall of traditional brick-and-mortar retail. However, what if you could create an in-store experience that motivates its participants to buy product? That is essentially the goal of experiential marketing, and pop-up shops are a great way to create the experiences needed to drive sales. While the pop-up concept has expanded to other consumer industries, it still remains a huge part of marketing campaigns in the fashion industry. Clothing, after all, is something that everyone needs, and every brand must find its own way to appeal to its target audience. However, in a highly saturated market, the competition is fierce. Fashion companies need a creative way to stand out from their competitors, and pop-up’s have been a proven method time and time again. Especially in the age of social media, pop-ups help generate word-of-mouth marketing - which is still one of the primary deciding factors in whether or not a consumer will switch over to a new brand from their primary or preferred brand(s). Visitors to a brands pop-up location are likely to share their experience through photos and captions on social media, which further encourages brand awareness and recommendations by word-of-mouth. 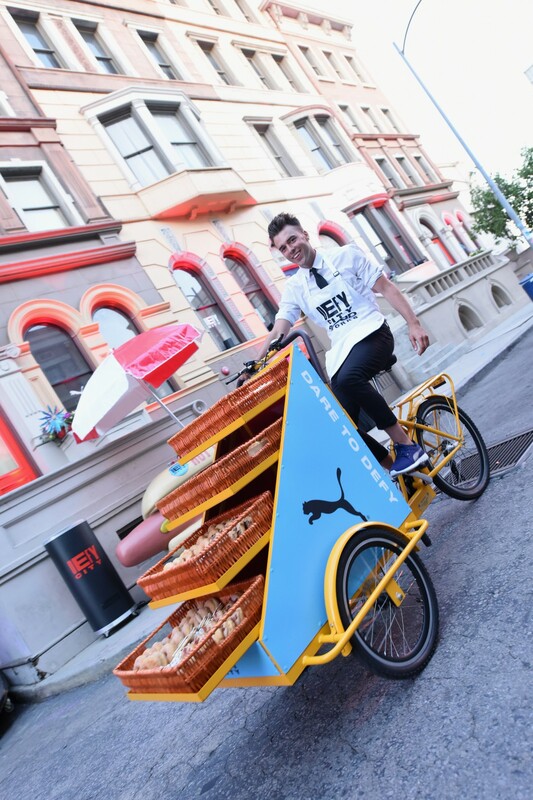 Yet, while many already-established brands are happy to spends hundreds of thousands, if not millions of dollars on experiential marketing campaigns, not everyone who is just starting out in the industry has such a generous budget to work with. And with the fashion industry becoming more and more saturated by the day, the time to start differentiating your brand with proper marketing is now. So what are some creative ways to create a pop-up shop, using nothing but your own knowledge, skills, and money? Fortunately, there are already so many ways that you can create an experience with customers. You can rent a stall at a farmers market or crafts fair, or use a shoppable van or trailer to ride from location to location, displaying your product inside. 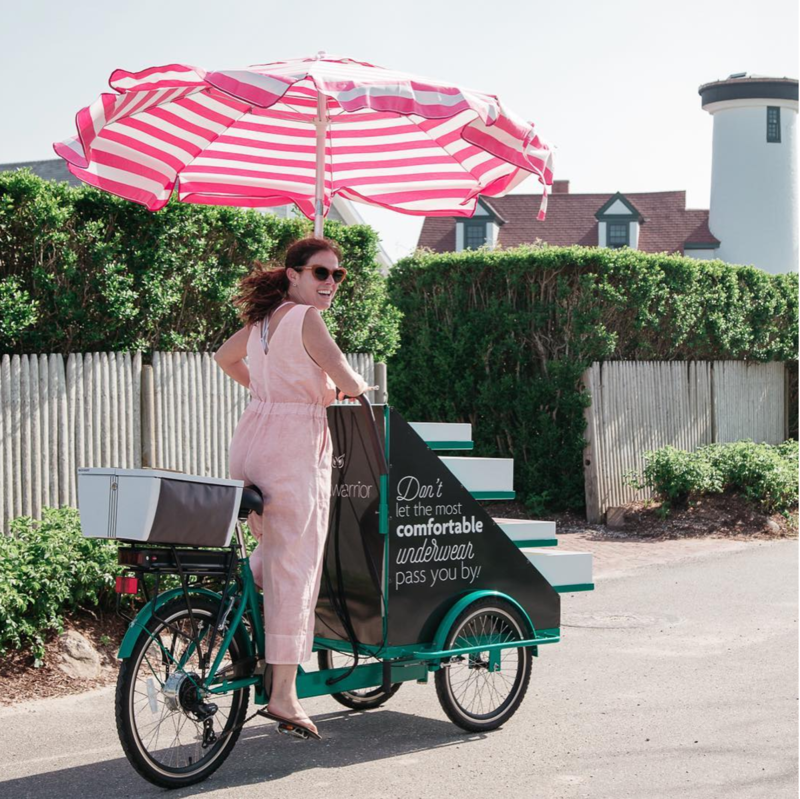 At Ferla Bikes, we work with restaurants who use our vending bikes as a pop-up location, where they promote their brand and allow new customers to sample their dishes. Restaurants may be the majority of our customers, but these methods work just as well with fashion brands looking to display their product. While we have sold our vending bikes to name brands such as Lululemon and Puma, we have also worked with smaller, independent companies, such as Uwila Warrior, to help promote their product and brand. In the case of Uwila Warrior, they began production in late 2016, with a mission to create more comfortable underwear for women. A worthy mission, yes, but how would they get their word out with the Victoria’s Secret’s of the world casting a large shadow over smaller, independent undergarment brands? It was simple - find a mobile solution that would be more cost effective than a mobile van, yet still catch more eyes than a typical table booth set-up. In which case, Uwila Warrior’s team discovered the Ferla Vendor, a mobile display bike which would help show off their product in a neat and eye catching way. Plus, they didn’t forget to add eye-catching branding, complete with a slogan - “don’t let the world’s most comfortable underwear pass you by!”. All in all, this project cost less than $2,000, and the bike is reusable for every new campaign - hard to say about your traditional pop-up concept! This solution helped generate awareness in their local Nantucket market, and now Uwila Warrior is on to bigger projects. No matter how small your business is, there is a way to create a unique and creative pop-up experience for your customers. With just a little spark of creativity and the enthusiasm needed to create a great brand experience, your company’s own pop-up experience is within reach. Kaity O’Keefe is the currently Director of Marketing at Ferla Bikes, where she has worked with several companies looking to promote their product in a unique and exciting way. 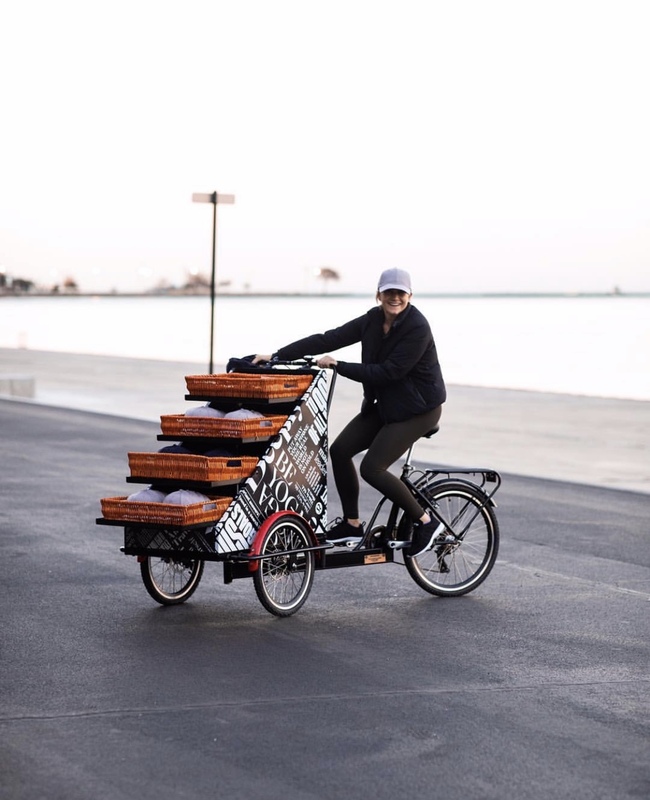 You can connect with her and the Ferla Bikes team by email at info@ferlabikes.com, on Instagram and Facebook @FerlaBikes, or by reaching out through their website at www.ferlabikes.com.